"Bill Eger is a flight attendant who has suffered from debilitating back pain on and off for 15 years. After just three SLM Bodywork sessions he is functioning like a normal person again and is so impressed he has signed up to do the SLM therapist training, initially as a part time job and then full time as he retires from flying in the coming years." "My career as a World Champion Boxer was destined to be cut short by hand problems before I discovered SLM. I had consulted some of the best surgeons, physiotherapists, chiropractors, acupuncturists and massage therapists for help but none could relieve my pain and keep me fighting until I found Steve Lockhart and SLM Therapy." Three times World Boxing Champion. "Steve thanks for all the miracles you have performed for me this year, without them I would have never have won the World Cup." For almost a year I struggled with a nagging groin injury that seemed as difficult to diagnose as it was to treat. After countless visits to anyone with a different perspective and method of treatment for this enigmatic injury, my girlfriend sent me to Steve Lockhart. He not only addressed and removed imbalances in my body (allowing me to move strongly, securely and painlessly once again), but educated me on how to prevent them from plaguing me in the future. Steve has given me an extra 5-6 years of work in a demanding industry. "After suffering a mountain climbing accident my lower back become a chronic problem. I had many treatments from Chiropractors, Physiotherapists and Osteopaths all to no avail. I felt that the exact nature of the injury and consequent symptoms were overlooked. No one even came close to Steve's ability in reading the body and feeling the knotted spasms in the muscles, providing instant relief. Steve was able to diagnose and then correct this imbalance. 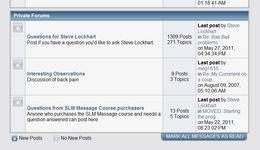 For those with any type of injury , weather muscular or joint, I would not hesitate to send them straight to Steve. SLM has been the difference of regaining my previous strength, flexibility and peace of mind. He has also assisted greatly in strengthening my core muscle group and provided welcome advice on how nutrition helps the rehabilitation process." "As a former National Track and Field Athlete I incurred an injury which I sought treatment for over a period of 5 years. I supposedly saw the best of the best- physiotherapists, acupuncturists, sports doctors, massage therapists, alternative therapists and so on. After years of running around and spending thousands of dollars no one could help my injury. I saw Steve intensively for just one month and he not only understood the dynamics of my injury he worked to alleviate my pain in this short period of time. And the results have lasted. I recommend Steve as the most knowledgeable and talented massage therapist I know. He is in tune with the body, passionate about his work and dedicated to fixing any problem you have. A truly amazing healer!" "When Dave ruptured the disc at L4/ L5 in his lower back the top neurosurgeon and physiotherapist he saw told him there was no way he could avoid surgery as his injury was as bad as they had seen. Desperate to avoid the knife he chose SLM Bodywork and 4 months later he is well on the way to a full recovery, back at work and improving every week. The doctors now cannot believe his improvement in such a short time, see for yourself." I am sure you would agree if I could help Dave fix a ruptured disc and avoid surgery then I can help you with your back problem. "Deborah was having lots of problems sleeping with her back pain which came on after she broke her rib. She had been suffering for 8 weeks before she had her first SLM treatment and hasn't looked back. Just wanted to let you know how excited I am about the results I am getting from your program. I have had really terrible sciatica pain for a year and have tried physio, acupuncture, osteo, chiropractic and various other remedies all with no results, until I got your book and DVD. I started the SLM Yoga exercises about three weeks ago and started noticing improvement within days and now some days are completely pain free. I am looking forward to a complete recovery soon. I was getting really desperate for some relief from the pain until I found your program on the internet.Thank you so much. I commenced Steve's program on 5th December, 2006 with the objective of correcting a long standing pelvic imbalance. I experienced an immediate relief in several tight, painful areas after the first session, and by week three, my pelvis had rotated forward and my 1cm leg discrepancy was almost corrected. Steve's program contains the most coherent, constructive advice and self-help treatment plans I have ever found on this subject. I am delighted with my progress so far, and am highly motivated to continue. I encourage others who want to help themselves to use this program as a path to regaining wellness. Graduate Certificate Infection Control FRCNA (Ret'd). Just wanted to say a quick thank you for your Self-Treatment program. I have been using this for about about a month and have noticed a big improvement all round! I was being treated by a chiropractor for a workplace injury I sustained some 12 years ago. My pelvis was unaligned causing fairly severe pain over the past few years. Anyway I received your self-treatment program and am thrilled. I have much more mobility on a day to day basis, as well as essentially non-existent pain (comes and goes, but greatly reduced). When a feeling of soreness or stiffness comes, I pop down onto the floor, do some SLM Yoga and the pain is gone. Thank you so much! I have followed your DVD conscientiously nearly everyday, and have benefited quite noticeably- better posture, stronger muscles and therefor better spinal support resulting in freedom from pain and more mobility.I keep reading portions of both books as there is such a lot of practical information in them both. My scenario is- am 74, suffered a lumbar disk lesion about 40 years ago, and, to avoid surgery, spent some weeks in traction. Have consulted many chiropractors and various therapists with (as you would expect) only marginal results, and, really have learnt mainly by painful experience what I can and cannot do, and am really grateful that eventually I came in contact with you. I've been in trouble with my back for almost 4 years & have only recently been able to function again socially, dress myself etc. I still can't put my own shoes on, or look after my own hygiene properly without my husbands assistance. I haven't launched completely into the program, but I have been using the SLM Yoga now for several weeks once a week. My first reaction to using the SLM Yoga, is that it is so........ easy to do. I have always found stretching to be hard work for so little gain, but the SLM Yoga technique feels good while I'm doing it. It just feels right. The biggest problem I have is muscle spasms in the QL's, & it feels fantastic to actively isolate them and work on them. Not to mention how great it feels in every other tight part of my body. (Which by the way is everywhere from my neck to my toes) In the last two weeks I've discovered also that by doing the SLM Yoga workout after I have a flare up (which is at least once every few weeks that I go into Spasm & irritate the disc in L5/S1), that the technique relaxes the spasms & minimizes the effects of the flare up. So I get back on track much quicker. I've also passed you web link on to two work colleagues who have recently developed problems with their back. I recommend it highly to people. I strongly believe in your theory in relation to muscle imbalance. It just makes a lot of sense to me & has helped me make sense of what is going on in my body. I used to participate in competitive sport, specifically, alot of cycling. I have had a 'bad back' for years, but always dismissed it as just something I have - and then, after a significant injury 2 years ago (snowboard related), I thought I would never cycle again. I was on the floor for weeks at a time, in pain, unable to move. After considering as many options as I could and visiting many different therapists, Myotherapy proved to be the most helpful. Still with the occasional day with a crook back, I was eager to try the SLM Yoga system. The benefit was immediate: from being on the floor to sitting up and capable of moving about - after just one session. After practising the yoga for several weeks now, it is evident to me how muscular imbalances play such a significant part in the pain associated with, and the recovery from, an injury. The SLM yoga system has helped me deal with both the chronic back pain I have had for years, and also recovering from an injury that at one point I was considering having surgery to try and fix. I can now ride my bike again :-) and did the Gong ride on the weekend: the first 'event' I've done in 2 years. I'm very appreciative Steve, that you have developed such a helpful system. It has helped me immeasurably, and I have learnt alot in the process. I am a triathlete who has achieved success on the world stage in the 40-44 age group on two occasions. I got hit by a car on my bicycle June 2005 suffering compressed fractures of L4 L5 and nerve /muscle damage. I would be happy to endorse your self treatment program as I feel that I have progressed and really know what you are on about with the treadmill of practitioners. To me my body is still recovering but I am achieving this thru your program and a positive outlook. 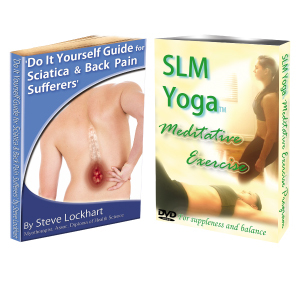 I have experienced a BIG learning curve since my Sciatic pain played up several months ago thanks to your Meditative Exercise - SLM Yoga CD plus read your books and found them filled with very easy to follow common sense information for the lay-person. Somehow I knew the information was out there in this technological world but I was really looking for something natural and simple - bringing things back to basics - which you succinctly do. Armed with the new information on your exercise regime and a change of a better choice of foods - your meditative exercise program now has been given a greater chance to do its magic. With my new awareness of these various facts I can now play tennis again as my body feels healthier and lighter. A lot of studies have been done by his father Dr. James D'Adamo on the Anthropology of Blood types. I realised that my cupboard was half full of foods that had been bought just because I had been conditioned to do so. You guess it - some were thrown out - and the rest to the chooks. My next change will be to try the detox regime you recommend in Dr. Sandra Cabot's book "The Liver Cleansing Diet" to give my body an even better head start and get it back to its normal healthy perfect state. I am very happy to tell my friends about your program and hope they also try it not just when they have pain but as a preventative measure. 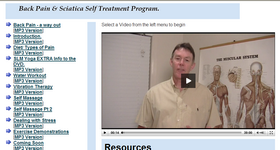 After years of upper back and neck pain I am finally getting some relief with your self treatment program. I've been to chiropractors for years getting immediate relief but always had to go back and never actually fixing the problem. Your SLM yoga hits the exact spots where my weaknesses are, you can actually feel it being so good for your back and strengthening it where it is weak. The rubber ball massages are great too, can't believe I can actually give myself a deep tissue massage, as soon as I get a pain from the gym or sport I get the rubber balls onto it and it goes away, normally my vertebrae would be affected. I get great benefit from the exercises that also hit the exact areas that need strengthening. After getting an SLM massage my back and neck were unbelievably pain free, I had never had a massage like it, you can actually feel the whole of the muscle letting go. Thanks Steve so rapt to be able to see light at the end of the tunnel and finally be pain free. Thank you for your follow up after my purchase of your wonderful system. I think your program has helped me greatly and I would be happy to endorse it. I am 53 this year. About 20 years ago I use involved in an automobile accident that left me with fractures in my pelvis, a broken shoulder, 8 broken ribs and a punctured lung. I also sustained many internal injuries. Considering the extent of the damage, I have almost no physical complaints today except nagging aches in my lower back and right shoulder. Also, my right leg became 1/2" shorter then before. I count myself truly lucky. However, as a typical 53 year old American woman, I have spent years at a job that required a long commute to and from the office as well as hours each day sitting at a desk. Lots of sitting, stress, and old trauma add up to pain that simply wouldn't respond to typical treatments. I have had physical therapy, x-rays, massage. Nothing could find the real problem or help for very long. However, after 5 sessions with your video, I can feel my lower back gaining strength and balance that I haven't felt in years. For the first time in a long time, I sleep through the night without pain. I am still sore in the morning but that is lessening now. I think very soon I will feel like really exercising again. I have told my massage therapist about your program and he wants to see your tape thinking it might be able to help other clients of his. Thank you for producing this "help yourself" system. In my case, it's been really wonderful. I am extremely pleased that I am now capable of a good days physical work. Almost two years ago I pinched my sciatic nerve and could barely move an inch because of the intense pain. With much difficulty I managed to drive to the doctor who informed me there was not much I could do but allow it to heal and he gave me a local anesthetic to remove the pain. That was fine for about eight hours and the pain returned. I began alternate day visits to the chiropractor and many good dollars later, in my frustration I researched to find out the cure and I located your site. Since then the road to my recovery has been only positive. I am amazed at how well I have improved my physical being and learned to manage the back pain that I have suffered in total for approximately ten years. My wife and I do the wall sits together and then follow with the stretching SLM yoga style. Each morning I have been driving to our block of land and working a full days manual labour. My latest project is treefelling some very large grey gum trees which requires constant back fatigue and lots of backbending work. When the day is complete it becomes a relief to get home and complete the SLM yoga program and feel the relief of any pain. I still have a constant awareness of my spine. In all activities I am thankful that I now have a confidence that soon I will have a complete and total recovery. Till then we will continue to benefit from this treatment. This product has my full recommendation to it. For the first time in over two years, I've not taken any painkillers for 3 weeks straight. The tingling and numbness in my feet has gone as has the pain down my legs. I can now walk at my normal speed for several hundred metres. I have started swimming again, doing the exercises as suggested in the book. The ball exercises for my back are the best thing that I have ever learnt. None of the specialists like physios, osteopaths, doctors, chiropractors ever suggested anything like it. The exercises you have given in your book are the best I've ever used - this is evidenced by better walking and better sleeping. I started the exercise program as soon as I finished reading the 'Do It Yourself Guide'. Your guide confirmed everything I believed was happening with my back and reinforced to me how it should be treated. Your book is the sort of information I have been looking for, for a long while. A book that takes a holistic approach to not only your back but your body and its health in general. Your book just makes so much sense. I have also recommended to people I have met to visit your web site. I am much more in tune with the muscles and certainly notice the difference under stress. Thank you very much Steve, I almost lost hope for a while and contemplated surgery, which of course all the physio's and chiropractors I had seen were saying. Just completed the SLM Yoga session. Wow what a good workout. I can certainly feel area's were I am weak and need some strengthening. So will definitely try and do it on a regular basis now. I have been prone to mid back pain for more than 10 years & in that time with the help of a good chiropractor I have been pain free for long periods. In recent times it has been taking more sessions with my chiropractor & more intensive treatments to attain the same level of relief. This time when my back pain returned I had purchased your self treatment book & with it & your clear answers in the forum I was able to treat the pain myself for the first time in 10 years without the need for any other outside help & for less than the cost of one visit to my chiropractor. Just wanted to let you know how effective I have found this program in a short period of time. Thanks Steve, I've been using the self-help program for 3 days now to correct rhomboid pain which has been ongoing for 3 months now. This is the second episode, the first one last 8 months in 2005/06!!!. I have had something like 30 chiropractic adjustments over the last few months, the effects of which barely lasted a few days. Also, I have been doing stretching programs for this entire period with little success. I have had really good results in just the 3 days since starting your program. I have found that doing the rubber ball work has really helped, just like your book says. Also my triceps in my left arm are still quite sore (again as the book outlined they would be). I had a perforated disc incident just over 20 years ago from which it took about a year to recover. I never had back problems again until now with this reoccurrence of sciatica down the right side, from the lower back to the ankle. My doctor prescribed an anti-inflammatory, which helped somewhat but not for long. After about 4 months of this I sent for your book, then your SLM program. I had major relief within two weeks of starting the exercises and also found the ball treatment very effective. It is now about six weeks and have virtually complete recovery except for the occasional niggle at the buttock. In my opinion this type of treatment should be the first thing anyone with a back problem should try. I was prepared to put up with the pain forever before considering having surgical intervention, as I have seen the sad results of surgery on two friends, one of which as been virtually bedridden for the past 5 years. Thank you for your program. Pat Jarvis. Mt Isa, Australia. I work at a desk on a computer for about 9 hours a day and am fairly sedentary. As a result of this I have been suffering pain in the upper back which radiates to the front of my left shoulder I have put up with this for 18months. On holidays in November, I pulled something? in my lower back and my movement was severely restricted. Since then I have been having fortnightly visits to my chiropractor, mobility returned, but has been still somewhat restricted. I received your self help program about a month ago. I have been following the yoga program about 3 times per week. Last week I forgot and missed my Chiro appointment, my back felt pretty good hence the appointment wasn't in my mind. I visited her (Chiro) yesterday. I sat on her bed as usual and she gently prodded my lower back, spine area, normally this is very painful but this time nothing. She then felt the area in my middle back that is always inflamed and swollen and asked me what I have been doing. She said my lower back and pelvis is back in alignment and she didn't need to do anything and my inflamed and swollen bits of my spine had improved significantly. She praised me for taking control of my own pain and told me to keep doing what I have been doing. Thanks Steve, although I was at first skeptical and reneged purchasing the program and SLM Yoga DVD, I am now very happy indeed. I want to say to you, that I am most impressed with your SLM system. In place of a SLM therapist here in Toronto, which I would happily visit once a month for tuneups, I've had good success with a shiatsu therapist, along with faithful adherence to SLM bodywork. Your two books and the DVD are exactly where it's at for my back and sciatica problems. They present the needed solutions, not understood in my experience with two medical doctor and three chiropractor visitations over a period of years. Your theories and knowledge of how muscles work, and how to cater to their needs for long-term relief of my pain has, to say the least, been most gratifying. Had you been available with your SLM system forty years ago ( I'm 74 now ), I'm confident that my pain-free years would have been increased by 40. Again, thanks Steve for the results of your successful efforts in the art of bodyworkings. Sorry for taking so long to get back to you....been a busy few weeks. Yes, its been 4 weeks (at the time of this email) since I started your program. I've been really impressed! After 4 weeks of following your advice, I'm at the stage where I am back to around 95% recovered. Some minor pain occasionally but I still working on getting rid of that! I previously had the same disc buldge injury some 9 months ago & did lots of intense physio to fix the problem. This took 4 months before I was at the stage where I am now. I would highly recommend your book & advice to anyone with any sort of back problem. I have found that your program makes perfect sense and have done a little with results felt immediately. My knees and hips no longer give so much pain when I walk. A little stiffness near the end of my hour of walking instead of constant pain. I still have a shoulder problem that has been giving me problems for over a year and many visits to chiropractors has done nothing to help.Now that I have sold my business I intend to spend some time getting myself back in shape using your program. I have lost 8kgs by walking and improving my diet and I have been able to avoid blood pressure medication by getting my blood pressure down. I will send a picture etc when I come back from my Easter break to Mildura. I am going to try to see one of your therapists as well. Please note: Results are not typical and may vary depending on the effort and time they are done and also on a persons age, condition and general health. People who carry out the exercises and follow the advice on this site do so at their own risk and those with existing health conditions should always consult their Doctor before they undertake the exercises in the programs or videos contained on this site.